It's a long story why I couldn't get Blogger app on my phone until now (I had a bad experience with the manufacturer, HTC) but I finally have it! Just testing it out. 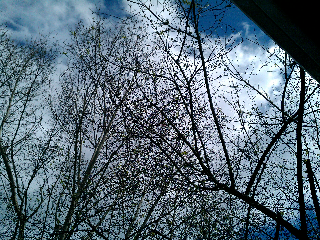 I took this picture Sunday afternoon its my ume (plum) tree. It grows hard green plums used for umeboshi. This year I'm going to make that and plum wine! They are the size of cherries right now I can't wait until they are ready for pickling! Super unexciting post I know lol. OK just to keep it slightly polish related, Twenty Ten is ready but no labels! Hope to get that ready today, sorry for the delay.